There is a similarly-titled question that asks whether it is possible to split an invention into multiple patents. The question here is what are potential risks of doing so. Patents may potentially be split up when two processes/systems have overlapping and non-overlapping steps/components. Patents may also be split up when one further expounds on or makes an "improvement" to a subset of another (e.g. more in-depth step/component). It may be desirable to have a quantitatively large number of patents and/or non-terminal disclaimered (non-TDed) patents for reasons not discussed here. 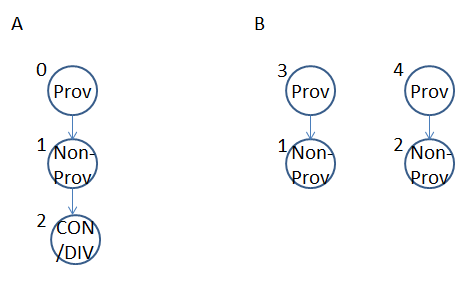 In order to achieve this, one may file according to two different scenarios A and B, shown below. Scenario A involves a provisional containing all related subject matter, which will be split up via a non-provisional and continuation. The benefit here is that one has all the original information together if needed for claiming purposes. Also, if one is lucky, an examiner might even issue a restriction/election requirement, giving safe harbor to a 'consonant' divisional, thus avoiding TD issues. However, because the disclosures of what are believed to be two distinct inventions are combined, the examiner may be more likely to issue a TD. In scenario B, the subject matter has been split up from the beginning (i.e. Prov 0 split into Prov 3,4). Splitting up the material as shown in scenario B may reduce the likelihood of an examiner requiring a terminal disclaimer, among other things. However, the risk is that if non-provisional 1,2 are not 'inventive' enough to stand on their own, it may be too late to salvage the overall invention (e.g. attempting to file a continuation-in-part from the two non-provisionals may pose prior art issues). Questions: Should scenario A always be used? Is scenario B too risky? Are there other ways to salvage scenario B if the two different disclosures need to be combined in order to get an allowance? Is the assumption that scenario B is less likely to invoke a TD requirement incorrect? Is there a better way to safely acquire multiple non-TDed patents on related but distinct inventions? This is opinion, as I'm not aware of any empirical way to measure this. I would suggest that scenario B should always be used. Assuming you have two separable inventions, then it makes sense that you would want to protect them separately, with separate description and claims, in order to maximise the scope of your protection. If they are described together, there is a risk that they will be described in such a way as to seem like a single invention. This can lead to the two inventions being seen as essential to one another, such that features could be imputed into the claims (in the US) or could be required to be explicitly inserted (in Europe). Moreover, if one invention by itself is not sufficiently non-obvious, then adding in another invention won't save it. Instead, you've either just limited your non-obvious invention with obvious features, or combined two obvious inventions to get a new obvious combination. There is no benefit to being able to combine two separable inventions. In addition, separating the two inventions makes the attorney's life a lot easier. This is, I believe, a factor which is most often overlooked, since attorneys would never admit it. While it's nice to consider that a hypothetical attorney will review every page of your specification to determine whether a feature could be added to the claims, the reality is that a time-pressured attorney will glance through it. The more unrelated features that are involved, the more chance there is of something material or useful being missed, or that a mistake will be made. Finally, keeping to one invention per application is honorable (though I realise this is an old-fashioned sentiment). If your invention is obvious, then you should not get a patent for it, and should not be unhappy that you haven't got a patent for it. You might be able to bamboozle an examiner to get a grant by throwing everything at them to see what sticks, but really, is that going to result in an enforceable, useful claim? Doubtful. Not the answer you're looking for? Browse other questions tagged prior-art filing continuation-in-part divisional strategy or ask your own question.